Getting Started with Ansible: How to Create Your First Playbook? Working in IT, you're likely doing the same tasks over and over. What if you could solve problems once and then automate your solutions going forward? Ansible is here to help. 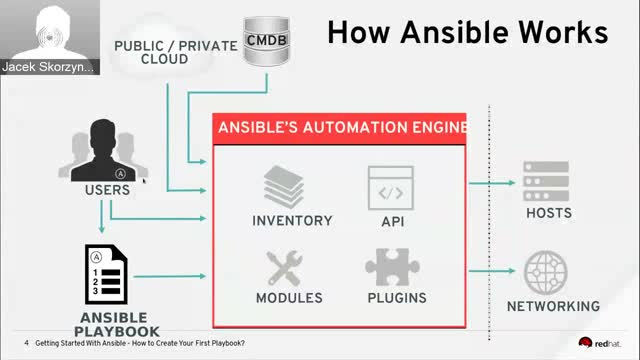 Ansible is an automation and configuration management technology used to provision, deploy, and manage compute infrastructure across cloud, virtual, and physical environments. In this webinar, you will learn the basics of Ansible and watch a simple Ansible playbook be created from start to finish. - What problem do Ansible Core and Ansible Tower solve? "Tomasz Cholewa, Lead Cloud Architect, Mindbox S.A. Dawid Szymański, IT Architect, Santander Bank Poland"
This session aims to present real technical level examples on how to build CI/CD pipelines, release secure containers – isolate them accordingly and what other tools you may need to deploy them on production successfully. It’s all based on our experience and the mistakes we’ve made to build a working solution. - How to integrate Red Hat Enterprise Linux with Red Hat Insights and how it works in practice." Watch this webinar to see how Platform-as-a-Service (PaaS) and Red Hat® OpenShift can help your organization move from the traditional environment to one focused on DevOps and efficient, scalable application deployment. - How to grow from small private cloud to multi-cloud experience"
infrastructures including Microsoft Azure. In this session, learn how OpenShift Container Platform on Azure helps bring application development and IT operations teams together to modernize applications, accelerate development processes, and deliver new services faster. Matt Hicks is the senior vice president of Software Engineering at Red Hat, where he is responsible for all product engineering. Hicks is responsible for products such as Red Hat® Enterprise Linux, the Red Hat JBoss® Middleware portfolio, Red Hat OpenStack Platform, Red Hat OpenShift, and Red Hat Ansible Automation, as well as the company’s hosted services, such as Red Hat OpenShift Online, Red Hat OpenShift.io, and Red Hat OpenShift Dedicated—which serve millions of applications and billions of requests a day. He has been with Red Hat for a dozen years and was one of the founding members of the OpenShift team. Before Red Hat, Hicks spent several years with IBM, a few startups, and as an IT consultant. John Gossman is a lead architect on Microsoft Azure, where he spearheads technical strategy and partnerships for Linux® and open source technologies. He serves on the Linux Foundation Board of Directors and co-authored the Microsoft REST API guidelines. Gossman was previously an architect on Microsoft’s UI strategy—where he popularized the Model-View-ViewModel pattern—andcame to Microsoft as part of the Visio acquisition. En este Webinar, Ana Rocha de Oliveira, Cloud Sales & Business Development Manager de Red Hat, abordará los retos de los departamentos de IT en España y la forma en que los solucionaron con tecnología open source y con cultura DevOps. La visión de Red Hat considera que una automatización integral es un componente estratégico y fundamental de la modernización y la transformación digital. Get an overview of the RHEL for SAP solution SKUs, discover what's new. IT operations is more complex than ever before. Automation and management are critical to keep pace and deliver business results. For many firms, the migration to public cloud is well underway. Understanding what motivates these migrators and the challenges they face along the way can help you in your own journey. > Their motivations and challenges. > The strategies they're adopting for migration. > What cloud migration in practice looks like. One of the most pressing questions enterprises have to answer is: “Should we move to the cloud or stay on-premise?” For many, the answer is a blend of both. Determining your organization’s cloud strategy can be complex. Important considerations must be made around security and compliance requirements, balancing the needs of developers, as well as the existing infrastructure implementations. Digital transformation is the journey all organizations must go through to compete and win in today’s economy. It includes fundamental changes across the business and information technology. The hallmark of digital transformation is that software differentiates in ways it never has before, and technology is no longer about running the business-instead it creates competitive advantage. To attain digital leadership requires embracing a new generation of technology that encompasses real-time decision platforms, cognitive systems, and the Internet of Things, as well as new processes and cultural perspectives. Digital leaders move fast and embrace disruption both internally and externally. No wonder 90% of CEOs are changing the way they use technology to be successful, according to IDC Research. Join this spotlight overview and hosted panel discussion to hear insights from top executives. Learn how to install SAP´s HANA database on RedHat Enterprise Linux, how to automate the installation process and how to make the environment high available. We will show you the installation live and you get to access all the tools we present. Independent Future Readiness Assessment for SAP Clients powered by West Trax and Red Hat to position at the very early stage of any HANA Migration and Digital Transformation projects. Since 15 years, West Trax has done >1600 technical analysis of the actual use of Client's SAP systems. Red Hat supports High Availability (HA) solutions for both SAP Business Applications and HANA. Join us to discover the solutions that provide minimum downtime for your mission critical SAP environment. The use of microservice architectures has exploded over the past couple years, but does that mean they are right for every business? When it comes to building a business case for containers and microservices, how do you determine whether or not this model is the right fit for your organization? Join this live expert panel moderated by Haidee McMahon, SDDC Technical Solutions Marketing Manager at Intel, for a deeper look and discussion around deriving value from microservices. Whether in a complex data center app or a web or mobile app hosted on cloud infrastructure, what is the underlying architecture behind the scenes? What are the pros and cons from a UX/UI perspective, if any, and how do you make a case for microservices in your enterprise? Building containerized cloud-native applications require learning and implementing new patterns which are essential for distributed applications. Circuit breakers, canary releases, blue-green deployment, dark launches, tracing and more which have been being implemented across many applications using the popular Netflix OSS libraries and various Spring Cloud annotations throughout your business logic. If using other frameworks or languages, you'll have to contaminate your business logic with even more boiler-plate and glue code. In this webinar, we will introduce Istio service mesh and how it changes the way you build cloud-native applications and reduces the programming overhead of building distributed architectures. Microservices are a great architectural approach with many benefits when done right. However, microservices alone are by far not enough to succeed in the API Economy. We argue that the inner and outer aspects of an IT infrastructure need to be constructed in a way so that microservices can be exploited and lead to the desired business benefits. In this talk we introduce the concept of Agile Integration as an approach to build an inner and outer infrastructure. This concept is based on three pillars: distributed connectors, containers and APIs. For the last 15 years, Manfred's work, research, publications and teaching have revolved around API-based integration solutions (application programming interfaces). He is a regular speaker at API conferences and published several thought leadership pieces in the API space like the “API Owner’s Manual”. He knows the whole stack of his trade, starting as software developer, researcher, developer evangelist, and product marketer. Currently, Manfred is Business Development Director for Agile Integration and API-based Integration Solutions at the open-source company Red Hat. Manfred holds a PhD in Mobile Computing and completed an Executive MBA. Watch the latest conferences, online events, on-demand webinars, and more. Title: Getting Started with Ansible: How to Create Your First Playbook?